Register Log In wirral forums Forums National News Rising crime? The media are banging on about rising crime on the basis of the police recorded crime figures, hardly mentioning that according to the Crime Survey for England and Wales, (CSEW) it is falling! Of the two, the CSEW is by far the better indicator. It was set up because recorded crime by the police was so unreliable, and it still is. In 2014, the recorded crime statistics were denied 'National Statistics' status - an indication that they are not considered reliable. Apart from different forces using different criteria, how much credence do you place on statistics you gather which may well reflect on your own performance? No mention is made of the fact that the downward trend in the CSEW figures for violent crime are supported by figures collected by hospital A&E departments. I don't know why the recorded crime figures are being taken as the truth. They seem very wrong to me. I guess you'd have to look at politics to get an answer. Bad news on crime is, however, manna from heaven to the police who are facing further cuts. It is also good news for the tabloids. Falling crime figures are the last thing either of them want to hear! Crime seems to be unrelated to policing across most of Europe. Most developed countries have seen the dramatic drop in crime over the past twenty years despite quite different levels and ways of policing. One theory is that it is related to lead poisoning from lead based anti-knock agents in petrol - now banned. 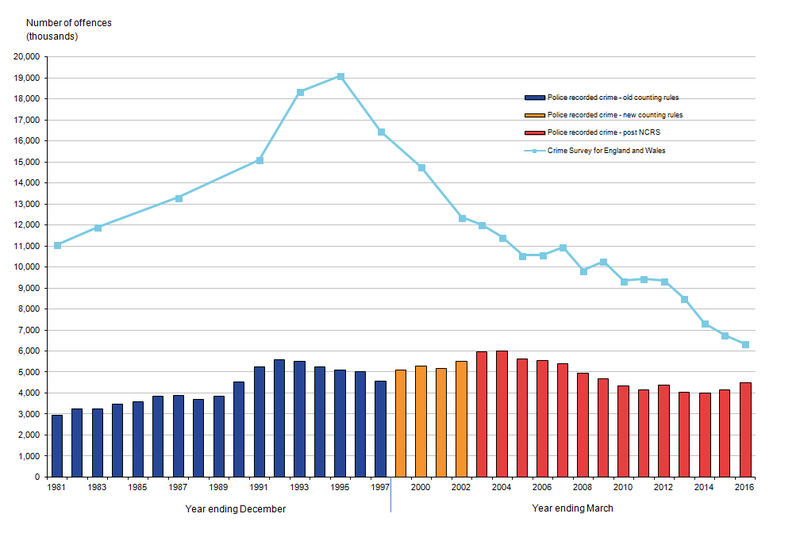 Crime falls dramatically about 20 years after it is banned. So I'd stick with the CSEW. You can download its latest report and a little googling will reveal the questions asked in the survey, the number questioned and the detailed methodology of things like weightings. It is evidently a very well run effort IMHO. By contrast the recorded crime figures come as bald figure with little or no supporting methodological detail. Frankly, I simply don't believe these figures. Reading through the CSEW report it quotes the police figures without question but then interprets things differently by using different categorisation. "The police recorded increases across all theft categories, but the most marked were in vehicle theft offences (up 11%, from 366,248 to 407,057) and shoplifting (up 10%, from 336,322 to 369,440). Both of these categories have seen rising numbers of crimes recorded over the last few years, with shoplifting increasing in each of the last 3 years and vehicle thefts in the last 2 years. However, these latest increases were larger than those seen in the year ending March 2016 (5% vehicle theft offences, 3% shoplifting)." So in that paragraph and the associated CSEW tables:- CSEW states the police figures for vehicle thefts increased and show 19% in the tables but then say its an 11% increase, however the CSEW table shows a 10% reduction for "vehicle related theft"
The CSEW hides the huge increase in vehicle thefts by lobbing it in with other vehicle related thefts. What is more disturbing is it avoids the reason for vehicle thefts, whereas at one time a vehicle theft was usually a simple hot-wiring or lock-picking job, it now has much more impact because quite often the keys are stolen from the property/person first or the vehicle is forcibly removed. Looking at the CSEW figures you would also think that anti-social-behaviour had decreased however by their own admission this is not the case. I don't trust either set of figures (police nor CSEW) but to hugely skew favour in one direction or the other would seem to be a leap of faith that I cannot see reason for. If anything I find the police figures less self-contradictory. The CSEW is doing comparisons between the police figures and theirs but usually fail to actually come up for a reason despite the quantity of words. Some years back, near me, a couple of revellers one new year's eve welcomed in the new year by proceeding down the street kicking off car side mirrors. Several dozen cars were expensively damaged. Now was the ONE crime or several dozen? Well it depends if you are a police force keen to show you have been successful in reducing crime, or one worried that cuts may be on the way. In the first case, it would be recorded as one crime. In the second case as several dozen. Neither answer is wrong as the police to not adhere to any national standard for such things. You are a fool to trust data that has been collected by an organisation that stands to benefit from a particular answer In my opinion that is why 'Nations Statistics' status has been withdrawn from the recorded crime figure. The CSEW figures have gone up AND down over time. The people who compile these figures are unaffected by any answer, and they follow good statistical methods and explain them. Their figures have ranged from 19 million in 1997 down to 5 million now. In 1981 they stood at (from memory) about 8 million. Meanwhile recorded crime figures have had a much smaller range. (About 3 million in 1981 which rose to about 5 million by 1997 and have stayed within about a million of that figure since. In the end, it comes down to whether you believe an independent bunch of expert statisticians running a survey of around 38,000 ordinary people's experiences of crime, or figures for convictions of the relatively small percentage of active criminals apprehended, collected with no clear methodology by policemen. Interestingly, neither figure shows any correlation between crime and the number of policemen! This will not, of course, stop politicians pretending more policemen means less crime. Sadly, it doesn't. The matter is a lot more complex than that. But whatever your opinion, I think you have to look at both sides of the story and I expected the Beeb to do so. It didn't. Last night's news at ten was an absolute disgrace. It was all about the 'increase'. The alternative view was only mentioned to discredit it. I'm sure if the CSEW figures agreed with the Police figures then the CSEW wouldn't exist, they have a definite motive for coming up with figures different to the police and if it is in the direction the Government prefer that would clearly be perceived as prudent. However if someone threw one rock at a car and it bounced off and onto another, that could be argued as one offence because the perpetrator only carried out one act in one place however the argument back would be that an illegal act occurred which had more than one consequence. 38,000 is very small sample, especially relative to the proportion of crimes. You have complained about small sample sizes being used for statistics on other occasions. As they have come from expert statisticians I would like to see the uncertainty figures which would demonstrate how wildcard their results are. In an uncertainty test I think you may find the police results are acceptably within the CSEW figures but CSEW have kept that quite very conveniently. If they are going to use expert statisticians they should be producing professional reports not sensationalised differences. My lad works in a city centre shop and they get almost daily shoplifters often on cctv but the police are not interested unless the value of goods stolen is over �100. Which often means my lad and other staff apprehending the thieves (usually smack heads nicking manuka honey or protein powders) to retrieve the stolen goods and then just letting the thieving ... go...and they know it as they come back time and again. Why Manuka Honey Fish? Is it because it's expensive or do smackheads use it for something? Only asking because I take spoonful of Manuka Honey every day. The CSEW figures cover crimes which are not reported to the police, and even minor anti-social behaviour. There is no pressure for them to reflect anything but their findings. I'm not going to argue over the wing mirror example. Neither option is 'right' or 'wrong'. It is up to the individual police force's policy, and that was my point in bringing it up. 38,000 is a HUGE sample size. It is a feature of the mathematics of statistical sampling that the bigger the population size, the smaller the proportion you need to sample to get a reasonable degree of confidence. Thus, with a population of 65,000,000, you can gt a reasonable estimate of whether the tories or labour will win an election with around 1,000 samples. Were the population to be - say - 1,000, you'd probably have to sample a half of them to get the same degree of confidence in your answer. Here are the two sets of statistics seen since 1981. I suggest you look at the CSEW's methodology and decide for yourself if and where there are flaws. Sadly, you cannot look at the methodology behind the recorded crime figures. They doesn't seem to be any! Interesting that there is local anecdotal information about the unreliability of police records as a measure of crime suffered by the community. I would reiterate that the reason the CSEW was set up in the first place was because of the unreliability of reported crime records. I am not in any way blaming the police for this. It is not really part of their job, and I have every sympathy with them very wisely deciding not to raise the paperwork associated with minor crimes when it will not help anyone by doing so. If you want an accurate picture of the level of crime, then a survey is the best way of doing it. It has the minor disaadvantage that it is always somewhat out of date, but this at least prevents politicians from overreacting to every short-lived blip. There is a paragraph I wrote which I deleted that is about sample sizes for witnessing an event, which is entirely different from looking for opinions. If you have a group of 10 people and only 2 witnessed an event(20%), if you interviewed 3 people(30%) out of the 10, you would be unlikely to interview someone that witnessed the event. If you multiply all those numbers by a million or even a billion, the same applies despite an unusually large sample size of 30%. There is a huge difference between getting general opinion and looking for specific events. I will check to see if CSEW publish their uncertainty figures, if they don't and they are using sampling then their results are meaningless. Eg if they come up with a figure of 123456 but their 95% confidence interval gives a range between 123 and 1234567 then quoting 123456 as anything near an absolute figure is highly misleading and if the police figure lies within the CSEW 95% CI range then it can be taken that the figures agree! The police are not using sampling and hence do not have a natural confidence interval however they could/may include one to allow for errors etc based on their previous statistical experience of error rates. CSEW do give confidence intervals, they usually appear to be a range of around 9% which is tighter than I'd expect considering the population size, sample size and number of crimes. But they also apply weighting. Maybe we all get an exaggerated idea of how much local crime is around , because of social media. No-one ever posts " my car wasn't stolen last night its still safe in the drive"
Every time I look at FB , loads of people have posted this that and the other have been vandalized or stolen in the Wirral area. Got a surprise reading one of the "my car WAS stolen last night" reports on my FB page -- I didnt know that if the police tow away your 'found' car for forensics, YOU have to pay �150 to get it back, its not added to the perpetrators fine . Venice, I know of someone who had all their work tools ( amounting to �thousands) stolen from works van last week, another young girls had literally half her parked car ripped apart by a waggon. Because no one was hurt they weren't interested in the car, but it was dangerous driving . Both incidents were given a crime number and nothing more. Not even a visit from the police. Are those reported crimes included in statistics I wonder ? Last edited by granny; 21st Jul 2017 10:14pm. Because its expensive and must be a ready market to move it on. The shop he works in doesnt allow them to keep it in a safe place. I guess also size makes it easier to steal. The only thing they can do is ban them from the shop. Certainly the media scour the courts for salacious material to print. It sells copies. The 'News of the World' (aka 'The News of the Screws') survived on this for years. The result of reading this material is that some folk are convinced that leaving the house after dark is almost certain to result in their being mugged or raped or murdered, and bolt the doors as the sun goes down. This is a ludicrous view of reality. In fact, you are safer now than you have ever been, but a very large sector of the population are convinced that we are living in a near lawless society. Some years ago I had occasion to trawl through copies of local Liverpool papers from the early 1900s. What struck me was the amount of violent crime including murders reported there. Almost every other day, the Echo would report some woman beaten to death or a man having his throat cut with a razor. It really did sound like the wild west. I suspect the reason for this was sheer desperation of the people - often Irish immigrants - living in terrible slums. Today, I think the reports of such events are much much rarer, and are as often as not the result of mental disturbance rather than social pressure. We are undoubtedly safer now than we have ever been in our History. These scumbags that are stealing and just lately seem to be quite prevalent in Wirral dont realize or care what grief they leave. Just read on another site about Ice skates etc all in a black bag belonging to twice British ice-skating champion being taken from car. These were especially made for her feet so not good for anyone else.Hope she gets them back she sounds devastated.